Its no secret that car buffs sometimes like to break the magical, and often unsafe, loomph barrier. With the aston martin db5, issued from 1963 to 1965, you could reach the ton without guilt. The db5 was a speedster whose upper-range stability and safety were unsurpassed. Top speed of 149 mph engine typedrivetrain: Double-overhead-cam 6 with triple su carburetors displacement 244 cu. In. Power rating 282 hp transmission 5-speed synchromesh manual (optional automatic) chassis: Rack-and-pinion steering; Front independent suspension by wishbones and coil springs, rear suspension by live axle, trailing arms and coil springs; Girling disc brakes front and rear with divided hydraulic circuits and twin vacuum servos; 15-inch wheels; 3,200 lbs. 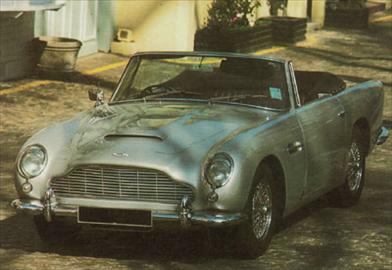 The aston martin db 5 was featured in the james bond film goldfinger with a few additions, including retractable front machine guns and a rear bullet-proof shield.